Saturday was my first trip in Alvin, diving to the bottom of the ocean, one and a half miles below the surface. The dive to the bottom was not at all scary but was exhilarating, magical, and full of life. Even before we got to the vent fields, and turned on the lights while sinking, we could see many little creatures, some small jellyfish floating through the water. Upon arrival at the bottom, we gently slowed down, as Alvin dropped its descending weights, and we set down on basalt rock from a recent lava flow. Some of the flow was cracked and heaved up, showing many layers upon layers of lava, each layer about an inch or two thick. We then transited a short distance to find the Vent-SID, which was peacefully sitting upright on the lava flow. Alvin easily picked up the SID with one of its arms and we transited to the deployment site. 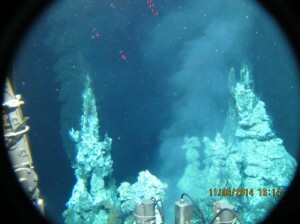 As we went, we soon entered the hydrothermal vent field, with large spires and ridges of basalt rising above, like looking up the sides of a small canyon. 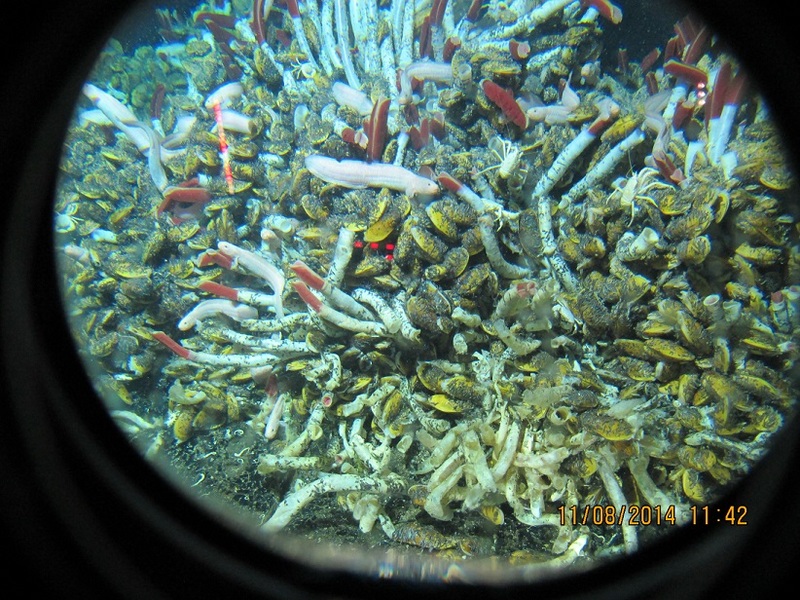 The spires and cracks in ridges were bursting with life, with lush patches of Riftia tube worms, abundant zoarcid fish (long white fish), and large shrimp swimming towards the lights of Alvin. It was a bit like being in a dream-like aquarium. And then I noticed the shimmering water, the hot hydrothermal fluid flowing up through the Riftia beds, as we flew over one large bed looking for our study site. It gave me the feeling that there was much energy and heat flowing through these beds and the creatures were cheerfully sopping it up. This was probably the Riftia bed where we were supposed to deploy our instrument. One thing I realized in Alvin is that it is hard to know where you are. We had to back up and try to get bird’s eye view of the Riftia patch through our portholes. This was the site. 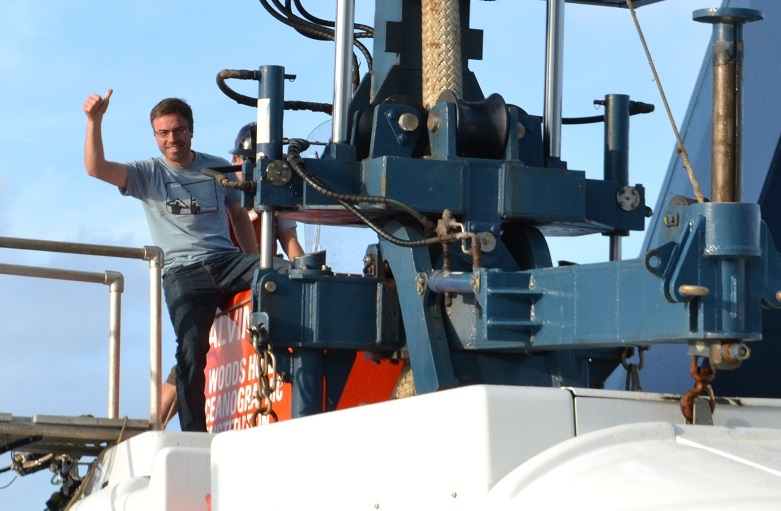 We deployed the instrument and then continued on to other sites rich in animal life, to collect various water samples and deploy collectors for other scientists on board the ship. Then we made our way to a black smoker field known as Bio9, which was 50 meters away. It was amazing for a moment how far away 50 meters felt in the dark bottom of the ocean. But the navigation systems do not lie and we quickly found ourselves at black smokers, which consist of white and black mineral structures towering a couple of stories high, with what literally looks like black smoke pouring out their chimneys due to sulfide and iron minerals precipitating out of the boiling hot fluid flowing out. I had to wonder what the people who discovered these not that long ago must have felt. How alien and wonderful these must have seemed. We collected a sample from the black smoker chimney and then we were finished and on our way up to the surface. On our arrival, a crowd of happy people greeted us. 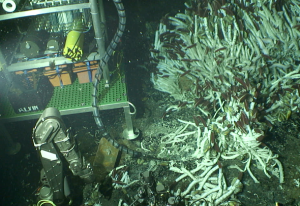 We reported that we successfully deployed the SID and collected wonderful samples for other scientists; the chunk of black smoker chimney was a particularly good specimen. We would have to wait until the SID surfaced the next day to see if it worked. It turned out our sampling bags were empty. Something went wrong with the SID. We later discovered that there were several “bugs” in the software that caused the SID to shut down prematurely. In some ways, it was a successful deployment, as the physical components of the SID seemed to withstand the trip, and we also obtained some initial filtered samples. We hope it is a matter of fixing the bugs in the program, and we can prove one encouraging scientist right, who said to us today, “It was good it didn’t work the first time, as it would have never worked again.” We plan to try again soon.